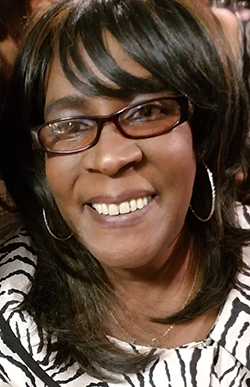 Carol Lynn Davis departed this life unexpectedly on Tuesday, September 25, 2018. She was a graduate of South Central Community College where she earned an Associate degree in Accounting. She was a member of Varick Memorial A.M. E. Zion Church in New Haven. Carol was predeceased by her husband, John W. Davis Jr.; her parents, Graham and Queen Ester Nixon; a brother, Graham Nixon, Jr.; and a son, Jeremy Davis. Carol is well loved, and leaves to cherish her memories; brothers, Edmund Earl Yates (Christine), Kenny Nixon (Dolores) and Charles Nixon; sisters; Barbara Ann Nixon and Muriel Nixon Ortiz; children, Bernard Comfort, Denise Canady (Devonne), Malika Comfort, Kenya Comfort-Clark (Joe), Johanna Davis (Kai) and John Davis IV; bonus children, Michael Wooten (Joann), Moneil Wooten, John W Davis III (Toni), Anthony Davis (Shonda), Andre Davis, Marian Stenson (Pat), Carla Davis and Monita Davis; a special friend, Marian Davis; and a host of grandchildren, great grandchildren, cousins, nieces and nephews. A celebration of Mrs. Davis’ life and legacy will be held Wednesday, October 3, 2018 at 11:00 a.m. at Varick Memorial A.M.E. Zion Church, 242 Dixwell Ave., New Haven. Viewing will be held at the church from 10:00-11:00 a.m. Burial will be private. I am so sorry for your loss. May the “God of all comfort” be with you during this difficult time. I have personally found comfort in the promise at 1 Corinthians 15:26 where it states very soon “Death will be brought to nothing”. Then, we have the prospect of being reunited with our loved ones right here on earth (John 5:28,29). I truly hope this brings you comfort and peace. With deepest sympathies, Gra and family. My sympathies to Carol’s family. May the hope expressed at Job 14:13-15 give you some comfort for your great loss. To Allah we belong and to Allah we return. My heart felt condolences to the family. I pray we all take a lesson from Carol’s death as a reminder to prepare ourselves and to insure that the relationship with our Creator is in tact; that we are in compliance with the covenant we have made with Him. May Allah bestow comfort and patience upon you all. Praying for comfort at this time. God never make a mistake, God allow Carol to be on this earth for an appointed time. NGod plucked her from this world and planted her in the garden of Heaven. She is resting in the arms of our savior. My Deepest Condolences. Death brings pain that time can only heal, no words could ease what you truly feel; But with God, her joy is eternally sealed, cherish her memories that death can’t even steal. Lift up a smile for she is already in paradise. May your loving memories be held close to your heart. My sincere condolences. You are in my prayers. I am sorry to hear you have lost our beloved sister Carol. She was my sister in law for a number of years and I love her dearly. I know she will always put a smile on ur face just with her beautiful smile. She’s a loving, kind, sweetheart of a person. I will miss her very much. She’s now in the loving arms of Jehovah God and will be taken care of as she watches over each of you. She is not gone from our hearts only from our sight. Carol will always be with us all in our hearts, thoughts, and amoung us speaking. I love you my sister in law and will miss you but will never forget you. You will not ever be forgotten. R.I.P. Carol Lynn Davis. My most sincere sympathies to the family for the loss of your dearly beloved. John 11:25 has proved to be very comforting for me and I hope it will comfort you also.